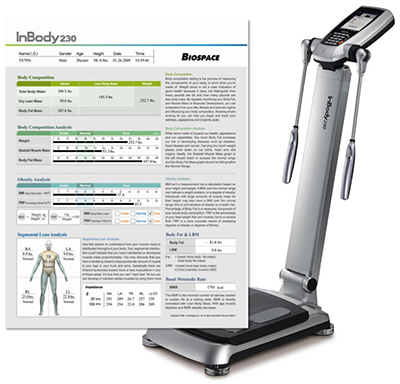 Bioelectrical Impedance Analysis (BIA) is a cutting edge technology for measuring body composition. The InBody Tracker uses BIA – a non-invasive electrical pulse – to estimate body fat and muscle mass. The pulse travels easily through water, blood and muscle, but less so through fat and bone, enabling the device to accurately estimate the amount of fat and muscle in the body. BIA is considered one of the most reliable and accessible method of screening body fat. It measures the impendence or resistance to the signal as it travels through the water that is found in the muscle and fat. The more muscle a person has, the more water their body can hold. A quantitative analysis which will be emailed to the patient and progress can be checked. You will be required to be bare foot for the analysis, which is very quick to perform, painless with reliable results. It is important to monitor your body composition ratio – a healthy state keeps a well-balanced, while an instable ratio may result in obesity, edema, malnutrition or osteoporosis. The ratio between muscle mass and body fat and the distribution of fat is more meaningful and important than body weight. Muscle is denser than fat, and that is why a slim person with more muscle can weigh more than a person with more fat. It is important to check muscle mass and muscle distribution, as this helps determine the effectiveness of your exercise as well as helps you prevent muscle imbalance. If the amount of mineral and muscle mass in the lower body is insufficient, this may overwork the joints and the risk of arthritis will increase.